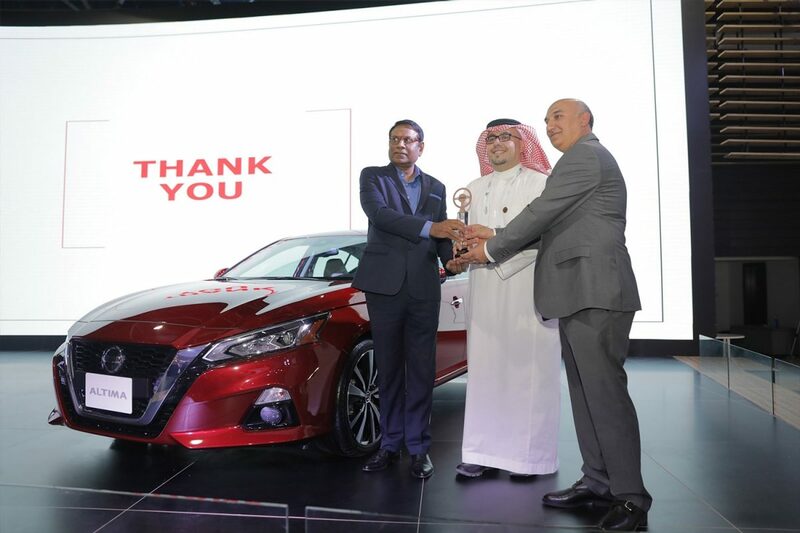 Jeddah, Saudi Arabia, January 24 2019: Nissan’s all-new 2019 Altima has claimed Sport Motor Magazine’s ‘Best Mid-Sized Sedan’ award for 2019 during a recent ceremony held in Jeddah at the 2018 Saudi International Motor Show (SIMS). The award was presented to Kalyana Sivagnanam, Regional Vice President, Marketing and Sales, for Africa, Middle East and India, and President of Nissan Middle East, and Bader Al Houssami, Managing Director of Nissan Saudi Arabia, during the Saudi International Motor Show with a large number of automotive media and professionals in attendance. The all-new Altima is the latest expression of Nissan Intelligent Mobility, making vehicles more desirable by re-defining how they are driven, powered and integrated into society. The car features Lane Departure Warning, Blind Spot Warning and Intelligent Forward Collision Warning, as well as Around View Monitor and Moving Object Detection giving a bird’s-eye view to assist with parking. Two new engines are introduced on the all-new Altima. Replacing the previous-generation Altima's 3.5-liter V6 engine is the company's world's first production-ready “variable-compression” turbo inline 4-cylinder. The engine delivers near V6-level performance with 4-cylinder fuel economy. Standard on all 2019 Altima grade levels is a new 2.5-liter DOHC inline 4-cylinder direct-injection engine. More than just the gains in horsepower and torque, the new engine offers improvements in noise, vibration and harshness, along with enhanced fuel economy and cleaner emissions. The all-new Altima's expressive design was inspired by the award-winning Nissan Vmotion 2.0 concept. The new Altima is lower, longer and wider than the previous generation with a highly balanced, aggressive stance that includes available 19-inch wheels and tires. Inside, the all-new premium interior features a wide "gliding wing" instrument panel – which accentuates the exterior's low cowl and hood, helping create an open, airy environment. Key interior comfort and convenience features range from seats with added bolstering for improved holding and support, to standard NissanConnectSM featuring Apple CarPlay™ and Android Auto™ and an 8-inch multi-touch color display.